Christmas Countdown 2012: 15 days! 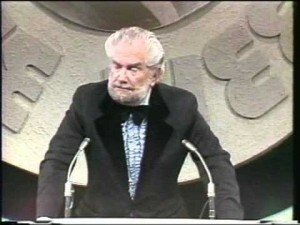 Foster Brooks (1912-2001) was famous for his hilarious (and fake) drunken antics at the Dean Martin Roasts in the early 1970s. As a kid, I remember roaring with laughter at his shtick. I still check them out on YouTube from time to time. They’re just as funny now as they were back then — especially when he roasted Don Rickles. Priceless! There aren’t many Christmas songs by the much-loved comedian, but this is definitely a classic. Listen — and laugh — as he butchers The 12 Days of Christmas.